The phrase “Mormon Moment” is not new to many of us. Anyone who followed the 2012 presidential elections became very familiar with this catchphrase. With the Republican nominee, Mitt Romney, being a devout member of The Church of Jesus Christ of Latter-day Saints, many people became keenly interested in Mormonism, a religion that beforehand had been somewhat of a mystery to many people. However, it should be carefully noted that a Mormon running for the office of President of the United States was not the only reason that interest in Mormonism had suddenly escalated. The critically acclaimed satirical musical “The Book of Mormon” — the story of two young Mormon missionaries sent to a remote village in northern Uganda where a brutal warlord threatens the local population — opened on Broadway in March 2011, and it achieved immense popularity in a relatively short amount of time. The show set records in ticket sales for the Eugene O’Neill Theatre. It was also awarded nine Tony Awards, one of which was for Best Musical, and a Grammy Award for Best Musical Theater Album. These two major events sparked the interest of the masses, and the phrase “Mormon Moment” soon became the buzzword of the day in both local and social media coverage. However, now that Mitt Romney is no longer running for President of the United States, and “The Book of Mormon” musical is no longer winning awards, it would almost appear that the spotlight of the “Mormon Moment” has suddenly faded. But, is that really the case? Two years after Mitt Romney was defeated in the presidential elections by Barack Obama, Mia Love, the former mayor of Saratoga Springs, Utah, became the first black female Republican ever elected to Congress. According to the 17 November 2014 online edition of Deseret News, the 38-year-old Love commented in her victory speech, “Many of the naysayers out there said that Utah would never elect a black Republican LDS woman to Congress. Not only did we do it, we were the first to do it.” With her victory, an astute focus has once again been turned to members of The Church of Jesus Christ of Latter-day Saints, and the “Mormon Moment” seems to have been revitalized, but this time, it is black members of The Church of Jesus Christ who are at the forefront. Love is not the only black Mormon who has gained national interest. On the same night that she was giving her victory speech, 19-year-old Milwaukee Bucks’ rookie forward, Jabari Parker, became the first teenager in NBA history to get two double-doubles in his first three games. Another prominent black Mormon is 25-year-old Ezekiel “Ziggy” Ansah from Accra, Ghana. As a boy in his native country, Ziggy played soccer and basketball and had absolutely no knowledge of American football. After converting to the Mormon faith, and being baptized at the age of 18 on 12 January 2008 in Madina, Ghana, he later came to the United States and attended school at Brigham Young University. It was there that Ziggy got his first taste of American football. After two and a half seasons, he was picked No. 5 overall in the NFL draft. He was also voted the Mel Farr Rookie of the Year by the Detroit Lions. Of particular interest is that the school motto of the Presbyterian Boys’ Secondary School, Legon, where Ziggy attended in Ghana, is “In Lumine Tuo Videbimus Lumen” (In Thy Light We Shall See Light). He is indeed a living witness and testimony of that school motto as he has embraced the Light – the Gospel of Jesus Christ – and has allowed the Light within him to radiate throughout the world. The spotlight is also shared by world renowned entertainer Gladys Knight who became a member of The Church of Jesus Christ of Latter-day Saints in 1997. She celebrates the success of being on the charts for her Top Gospel Albums. Her latest project, titled “Where My Heart Belongs,” released by the Mormon-label, Shadow Mountain, is a testimony of her life. The Restored Gospel of Jesus Christ has brought great peace and joy into her life – a peace that passes all understanding – that is evidenced as people notice the new radiance about her. Latter-day Saints comprise less than 2 percent of the U.S. population with the exact number of black Latter-day Saints being unknown. However, in the state of Utah, where 60 percent of the population is Mormon, blacks make up less than 2 percent. 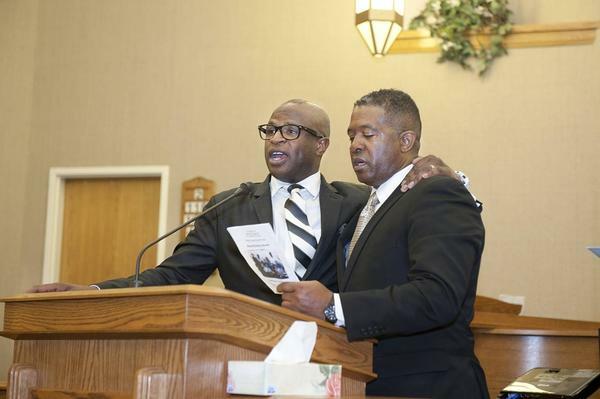 Nevertheless, whether the current “moment” is dubbed as the “Black Mormon Moment” or not, the fact remains that the number of high achievers within The Church of Jesus Christ who are black is on the increase. The short list of those who are high achievers includes, but is not limited to, Harvard-educated Kenyan-American Shaka M. Kariuki, who runs the investment firm Kuramo Capital; Yeah Samake, the Malian mayor who has run for president of Mali twice; Cathy Stokes, the former Illinois public health administrator who became a prominent Utah community leader; and Alex Boyé “whose cover of a popular Disney tune garnered more views on YouTube (54 million) than Coldplay’s latest hit,” according to the Deseret News article. I am incredibly pleased to note that there are so many examples of people in the LDS church who would formerly have been shunned or somehow excluded by some other members of the church but are excelling and, presumably, feeling accepted as fellow children of the same Heavenly parents. I hope it continues in and out of the church for people of African descent and everyone else. I grew up in a part of Salt Lake that was as racially integrated as it could be in a city that was overwhelmingly Caucasian. It wasn’t until I was about 11 that I had any idea that racial discrimination even existed. I have been yearning for the day it no longer does every day since. It’s great to see these examples of steps toward that dream. There may be some differences between members of the Church because of heritage, culture, and background, but the reality is that we are all children of the same Heavenly Father, and therefore, we are brothers and sisters. We are all working towards the same goal of one day returning to live in His presence for all eternity. Therefore, whether the “moment” is simply dubbed the “Mormon Moment,” the “Black Mormon Moment,” or whatever the title that is chosen, as members of The Church of Jesus Christ of Latter-day Saints, we all share in the “moment” because we don’t allow our differences to divide us, but rather we stand united as one big family.